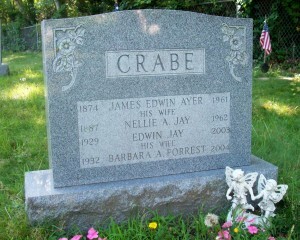 Born: 1874 in Providence R.I.
Died: April 9, 1961 in Bourne Ma. at 84 yrs, 3 d.
Married (1): August 18, 1894 in Bourne Ma. 1. Minnie Esther Crabe; (June 22, 1896 – ? ); Minnie was born in Harwich Ma. 2. Ethel Maria Crabe; (July 19, 1899 – ? ); Ethel was born in Pocasset Ma. To: Nellie Aldana Jay Holbrook; (1887 – 1962) (Charles J. Jay & Mary J. George); Nellie married (1) George Walton Holbrook (1884 – ?) 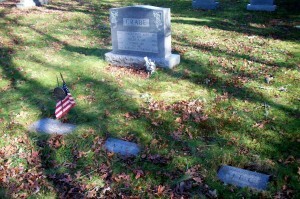 (James V. Holbrook & Angeline R. Weatherbee) in Charlestown Ma. on September 11, 1905.